International travel frequently means visiting exotic locales, meeting interesting people and always learning something new. If you’re ready to travel to a country that is interesting and affordable and doesn’t require a marathon airplane trip, it would be Peru. 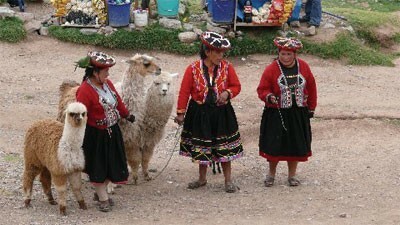 Peru ranks high on the list because of the diversity of its people and interesting destinations within the country. From an agricultural viewpoint, it’s like a trip back in time. On my second trip there this past April, I learned how a seemingly minor event can change world history. Consider the case of the common potato. The potato has been a staple crop around Lake Titicaca and Peruvian Andes for approximately 5,000 years. 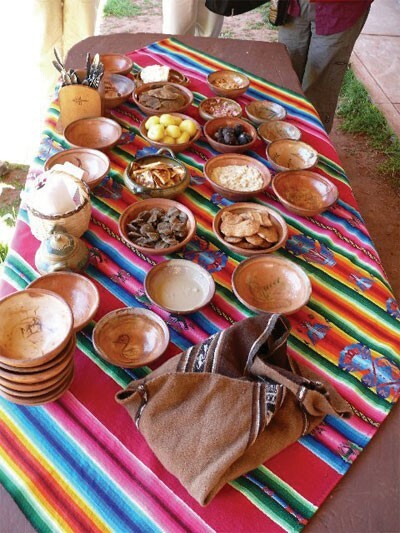 The Peruvians claim that they can grow 3,000 varieties but have winnowed it down to about 1,200 of which perhaps 200 – 250 are in regular cultivation today. By the way, Lake Titicaca at 12,500 feet is the highest navigable freshwater lake in the world. The pre-Inca Aymara people who still live in this area of the Andes reportedly domesticated the potato. The Incas refined its cultivation and the Spanish invaders introduced the potato to Europe during their Colonial Period as feed for livestock. Europeans grew them as another crop but to the Irish, it was the major crop. It was the potato blight in Ireland that forced so many Irish to migrate to America. So, if you are Irish or of Irish heritage, go back 5,000 years to the mountains of Peru to learn the reason for your being here. Peru is about three times the size of California with four major and different geographical areas. The people of each region are different; they look different, they dress different, their foods are different and the customs of each region are different. Fly from the city of Lima to the bustling frontier city of Iquitos at the western edge of the Amazon jungle for that once-in-a-lifetime Amazon River trip. A one hour flight from coastal Lima takes you to Cusco a city still showing strong influences of the Spanish Colonial era. At about 10,000 feet Cusco is a modern city where visitors get their first glimpse of the Andean people. Travel by bus from Cusco up into the Andes and you will think you have traveled 500 to 1,000 years back in time both in culture and tradition. And of course there is that trip to the magical ancient Incan site of Machu Picchu. But that is for another article. Typical of the many small settlements I visited high up in the Andes was the village of Iscapatasca, miles off a paved road, on the shores of Lake Titicaca. The inhabitants are direct descendents of the Aymara people who began their migration north from Bolivia and Chile around 2500 BC. The Aymaras predate the Inca civilization and no one in the village has any idea of how long their people have lived there. 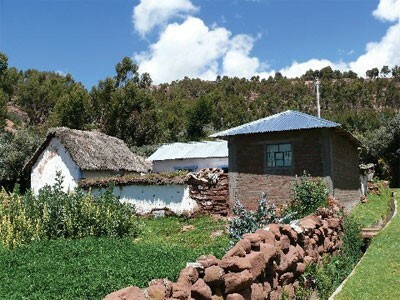 To put the village’s location in proper prospective for those who demand preciseness, the community of Iscapatasca is in the in the Province of Puno and the Districts of Puno and Acura. It is closer to the borders of Chile and Bolivia than it is to the capital of Lima. This is a farming community and like most villages in the mountains, the residents are self sufficient, growing their own foods and usually bartering for necessities. At 75 years of age, The president of this community of about 20 families is Sr. Jerrado. The community has electricity, as do most villages in the country, and a few families own televisions. Electricity is generated from the rivers whose source is the run-off from the glaciers high up in the Andes. The glaciers though are melting faster than they are being replenished which means major problems in the future for Peru and other countries dependent on them for water and generation of electricity. Housing in Iscapatasca is not the traditional adobe and thatch seen in the lower elevations. Villagers here live mainly in houses of cement block and/or adobe with tin roofs. Thatch has to be replaced approximately every seven years and tin roofs are a trade off since they have a life expectancy of 20 years. The down side is that houses are hotter in the summer and colder in the winter and during heavy rains, conversation inside is almost impossible. Life expectancy for these people is about 75 years and there is no retirement age. Men work the fields until they are unable to and women are always working at something; spinning wool, weaving, cooking and also working the fields. Their generally good health and long life are attributed to a lifestyle of hard work and eating natural foods, generally grains and vegetables. Smoking is a rare occurrence. The main health problem for them in later life are cataracts because of the ultra-violet rays at these altitudes. Very few wear or need to wear glasses and never sun glasses. In these villages families farm their 2 – 4 acre plots the old fashioned way. Cows or donkeys are used to pull hand made wooden plows with the husband and wife both working the animals. In the fertile valleys of Peru, larger cooperative farms can afford to rent machinery for planting and harvesting. Because private acreage is so small, animals are tethered in the fields or by the roadside to graze. There are few open pastures for the livestock to roam. In the mornings and afternoons farmers can be seen going to their fields or back home carrying their hand-made wooden plows over their shoulders and herding their livestock, frequently on leashes. Family farms get smaller and smaller as acreage is divided among children, a situation not unlike that in many other parts of the world throughout history, causing children to leave the farms for employment in the cities. Children who remain in the villages begin working in the fields full time at about 14 years of age. As you would imagine with small farms, livestock numbers are small, but they do raise cows, goats, sheep, pigs, some horses, mules and chicken The ever popular Peruvian animal, the guinea pig, is often seeing running free inside the small homes until it is time to harvest a couple for dinner. Llamas, an important source for food and wool are raised at these higher altitudes. Larger commercial ventures raise Gunacos, Llamas, Alpacas and the animal known as the “Peruvian Gold,” the Vicuna which are not permitted to be exported out of the country. Potatoes, a mainstay in the diet of these people appear in many forms at almost every meal. Cooking, at least for tourists, is done on the ground in beehive style ovens made from clay. A shallow pit is dug and stones are mounded over the depression. Wood is placed inside and lit. When the fire has heated the clay, potatoes are thrown in the front opening, which is then sealed, and left to cook for about 20 minutes. When ready, women use sticks to smash the stones. The cooked potatoes are separated from the ashes and put on plates. When eating them, with the skin on, one is apt to find residue from the stone imbedded in the skins. 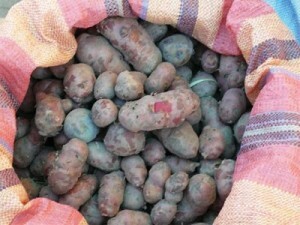 Most Peruvians eat their potatoes and vegetables cold. 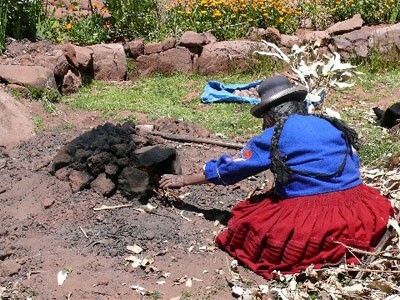 In the north of Peru, for special occasions, ovens are made from stones, and meat is often thrown in with the potatoes. These are truly portable, environmentally friendly Bar-B-Qs. Construction is on-going everywhere in the country. World-wide financial problems do not seem to have had a major impact on the average Peruvian. They pay for the land and materials with cash and build as money becomes available. It might take years for a house, once begun, to be finished and inhabitable. Their housing is not up to our standards, but for them it is a big step up. Peru is about a six hour flight from Miami. The official language is Spanish but in major cities and most tourist areas, English is spoken. In the remote regions an interpreter would be needed for people who speak Spanish and/or one of two ancient native languages. The exchange rate is 3 to 1. And staying out of fancy tourist restaurants will save you big bucks. Except for remote areas, the dollar is accepted. However, make sure your bills are clean and not torn or written on. They will not be accepted, something most tourist companies fail to let you know.